The RC Ford Lightning S. Team Roller: What more can we say? 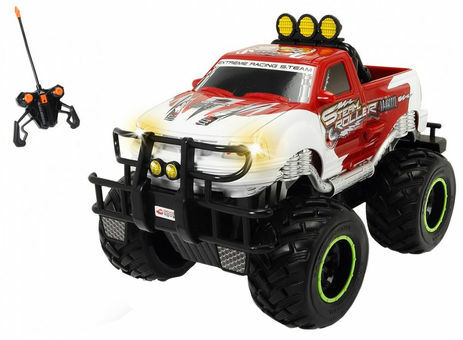 The Dickie Toys RC Ford F150 Lightning SVT S. Team Roller is everything that a child could desire in a monster truck: The pick-up has the typical look with the large rubber tyres, and brings monster truck power into the playroom. It is radio remote controlled, reaches speeds of up to 10 km/h and is ready to go immediately with the provided batteries. The headlights come on while driving, just like they do in real trucks. If things get a little rough, the bumper of the toy car is impact resistant. The fine steering control ensures that the driver can keep the vehicle on the straight and narrow The S. Team Roller is the epitome of agile driving enjoyment and realistic design.